Someone forgot to tell me that there was going to be a party in my bed at 6am, I usually prefer a little bit of notice. 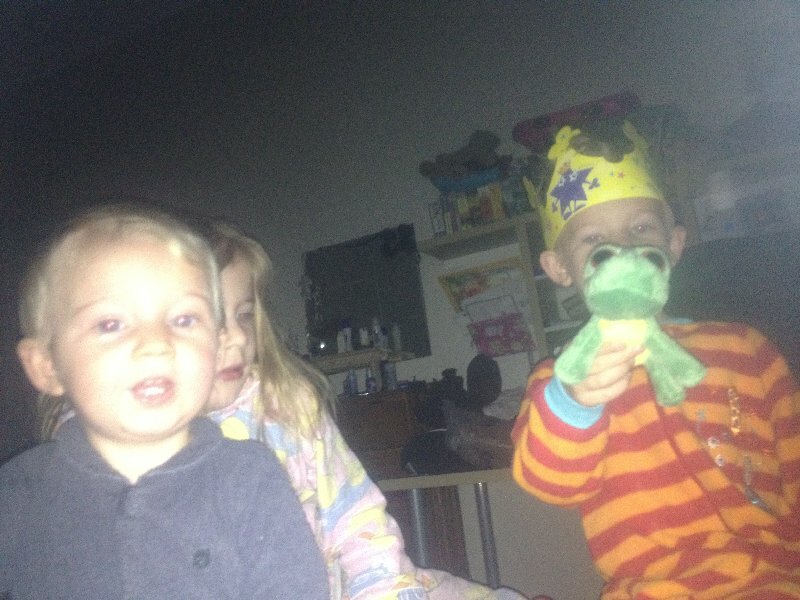 Our first night in Broken Hill was actually a bit rough, the kids went to bed late, no way around that i'm afraid. It's part of the territory when you rock up unannounced and expect 5 beds to miraculously appear. Not that they would have gone to bed at their usual time anyway. They were so happy to be with their cousins they were bouncing off the walls in all directions. When I finally got to bed I could feel a headache coming on, but with Oshawott asleep next to me, and Pichu asleep on the floor I didn't want to risk sneaking back out again to get tablets. I figured a good night sleep would do the trick. Stupid of me. Never has a headache just disappeared on its own before, why would it start now? My nights sleep was not quality at all, I think my sub conscious was in so much pain from the headache it just couldn't relax at all. Added to that, was knowing that Pichu was asleep on a folded up doona on the floor without his sleepsuit on (that was in the suitcase that went to Perth). So I checked on him frequently, covering him regularly. Then at some early hour of the morning I heard a soft thump, it was Pichu. He had rolled off his 'bed' onto the cold floorboards and had tried to crawl back onto the warm soft spot, only partially successful. Feeling a little guilty I scooped him up and put him in bed with me. He slept on and off for a couple more hours. Me, more off then on. At a quarter to 6, he was awake for the day, and because he is impossible to silence, so was Oshawott. I set them up with some "i" devices and tried to get some more sleep. My niece was up early that morning, she normally sleeps in, but knowing the cousins were here it was too exciting to sleep in that day. She must have heard us through the door and she came in for a visit at 6am. So there was three of them, watching movies, playing games on the iPad and eating biscuits. And one of me, head thumping, eyes not able to stay open, trying to doze through the 'party'. 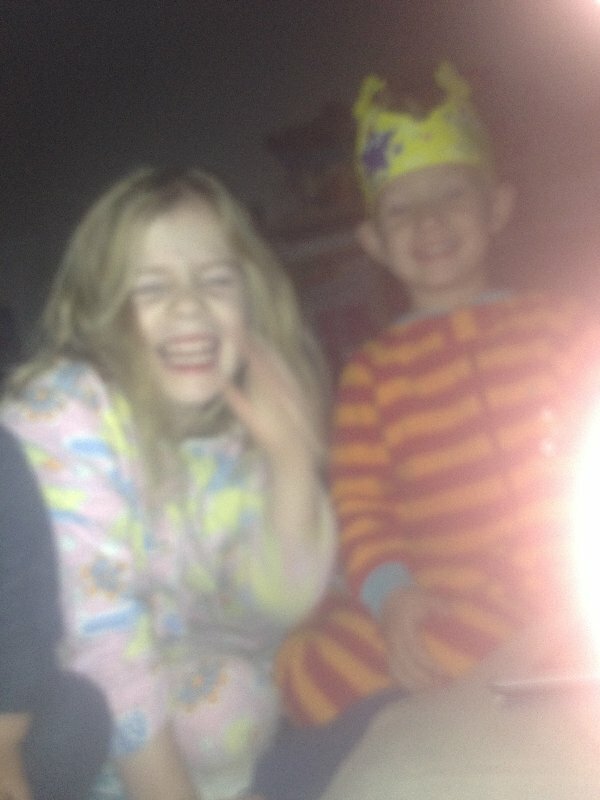 Taken in the dark, the iPhone cannot get a handle on the focus. Oshawott really did get attached to his Hungry Jacks party hat, he kept it on for a few days until it fell in the toilet and got wee on it. For our second and obviously, subsequent nights, my Brother-in-Law dug out the old cot we had used back in Janurary when we squatted in our own house. The familiar cot was welcomed happily by Pichu, I think he forgot how much he disliked it last time, luckily! Or perhaps it was the rolling onto cold floorboards the previous night... well this night he slept like a champ!